Wonderware SmartGlance Android app for 2016 released! 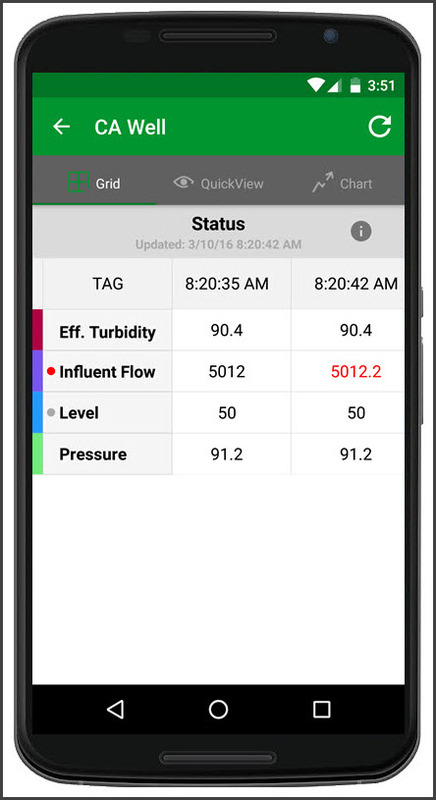 We are very excited to announce that we have released a major update to the Wonderware SmartGlance mobile app for Android. This major release brings a completely redesigned, fresh and modern look to the app as well as some significant performance and usability improvements. All current Wonderware SmartGlance Android users will have the opportunity to apply this app update for free upon its release to the Google Play app store. 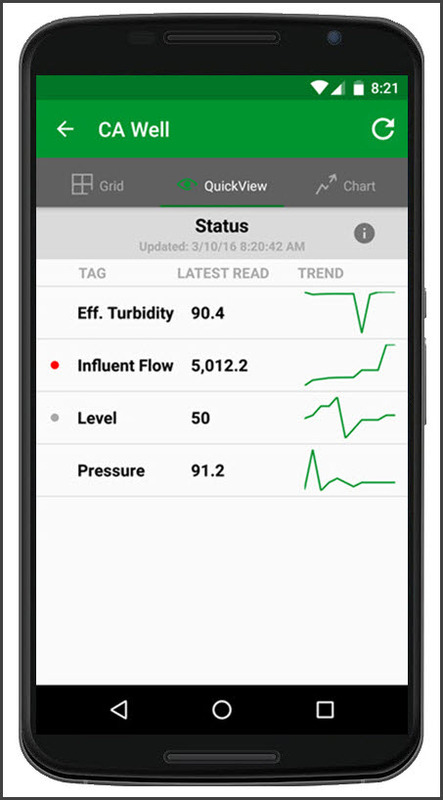 The new QuickView home screen helps you to immediately understand what the status is for your process, assets, team and production KPIs. We present a focused summary screen available for each report with a list of tags from your time-series data source (such as the Wonderware Historian) , their latest value and a sparkline trend for recent historical context. This helps to immediately bring into focus real-time or near real-time values and metrics that matter into the hands that matter for actionable follow-up and quick analysis. New charting visualization with toggle. Our new charts have several improvements. For example, you can now plot up to 6 tags instead of just 2 as it was previously. You can also toggle trend lines on or off to instantly contrast and compare trends across several tags. We offer a quick view to switch between plotting multiple trend lines along a common Y-axis and scale to plotting multiple trend lines comparatively against their own scale each with their own engineering unit or unique unit of measure. This is managed with the 1/2 or 2/2 icon that alternates between Mode 1 of 2 or Mode 2 of 2. QuickView with highlighted cell in Alert. 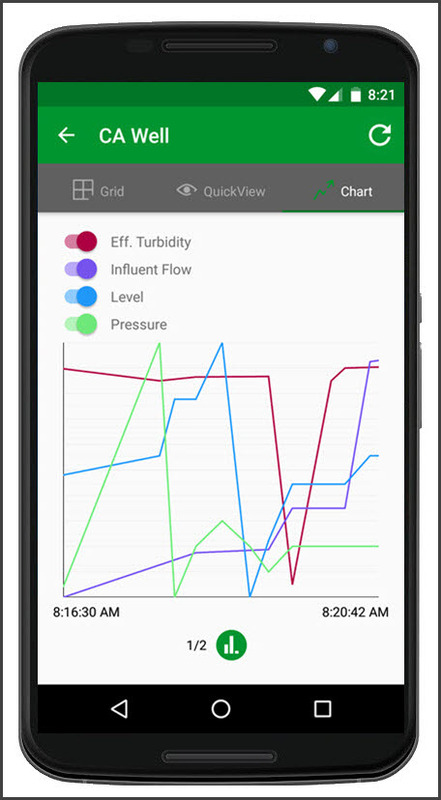 Here you can see that in addition to the QuickView home screen, you can also drill down into the details of recent historical values and scroll across time intervals to review the raw data in our Grid view. Simply tap one or more (up to six) tag names to select them for visualization. 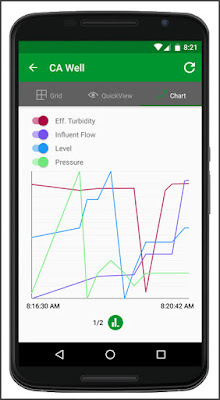 Once you are satisfied with the tag selection, tap the Chart view to view their trends. In this specific example illustrated in the screenshot, the "Influent Flow" tag has an alert value and thus the value of the tag has been highlighted in red to bring immediate attention to it. It is really easy to set an alert. Simply long-press (or press-and-hold) the name of any tag from either the Grid or QuickView screen to access the Alert menu. Tap the floating menu option "Add Alert" to enter into the alert configuration screen. From there, simply pick an alert expression (e.g., greater than, less than, equal to etc.) and specify a threshold target value. 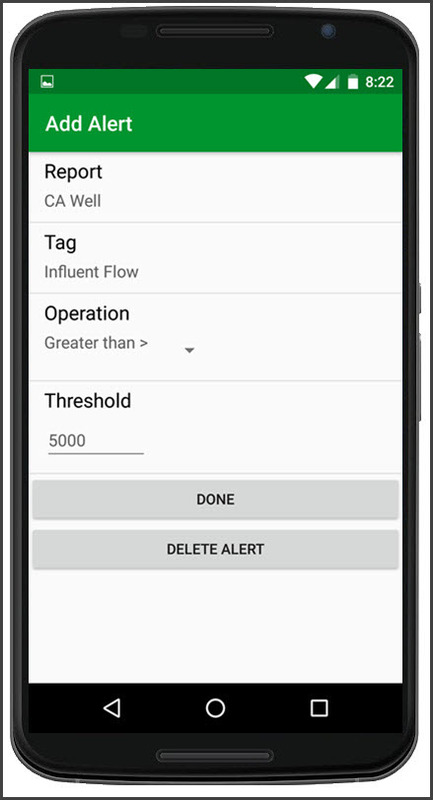 Once an alert has been set, on the next update cycle, the alert condition will be evaluated and you will receive a push notification from the Wonderware SmartGlance app on your phone very similar to a SMS text message experience. Tap the notification to launch the SmartGlance app and jump to the relevant report. · How do I obtain the new version of the Wonderware SmartGlance Android app? o The new version of the Android app is available for download from the Google Play App store. o If you already have the SmartGlance Android app installed, this new app will appear as an update in the “Google Play App Store” and replace your existing version. o Android Version 4.0.3 and above is supported. · What about apps on other platforms? o You may have noticed that we have already released a major update to the iPhone platform in November of last year (2015) and now, we are staying on target by releasing a similar, major refreshed update for Android just a few months later. o We'll continue to bring updates to additional platforms over time. If you are interested in participating in early BETA experience programs for any platform, please send us an email at feedback at wonderware dot com. 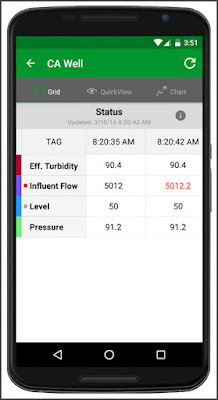 o The suite of Wonderware SmartGlance mobile apps continue to deliver on its core promise of making it super easy to leverage mobile and wearable devices to stay connected to your industrial business, anywhere, anytime and from any device. This new version of the Android app builds on that foundation and yet also benefits from a completely new underlying technology platform surfaced by a fresh and modern look and feel. · What’s planned for the next Wonderware SmartGlance Android update? o You can expect a series of rapid updates over the next couple of weeks to continue to enhance the Android app. Please send us your feedback and your impressions using the in-app feedback feature. o If you had any favorites, we have moved them to the new curated “Recent” report list to make them quickly accessible to you. Reports that you use the most often will appear at the top of the report list so that they are always instantly available. If you ever need a report that you don’t frequently access, you can easily scroll through the complete list of reports that you have been securely subscribed to or tap the search bar to start typing and find them quickly. o If you notice a feature that we didn’t bring forward, let us know what it is and why you found it useful and we’ll be happy to consider it for a future release. You can also monitor the App Release Notes included with each app update from the Google Play Store over the next several weeks to see the new features being added or refinements being done the app. o Please use the new in-app feedback option to send us your feedback and even a screenshot if that helps. To send us feedback, tap the “Send us your feedback” link directly in-app from the new “Settings” menu option. o You can also write to us directly at feedback at wonderware dot com. Wonderware SmartGlance Android BETA now available! Searching for an app to help you track a mobile phone? Check out https://www.toptrackingapps.com/, the leading app for tracking app reviews. It provides you with a list of best mobile tracking apps for iPhone and Android smartphone so that you can easily select an app to track and monitor a phone. Most often you may not find all the Amy Adams Skin Care beauty products in a single shop so you may have to hop from one shop to the other and drive around quite a bit to find your right retail stores.